Ida is strengthening as evidenced by the latest recon. A surface wind estimate of 97 mph was recently recorded. Remember that wind gusts of 15-20% should be found with sustained winds. We still think that NHC is a little high with winds at 100 mph, we may be too at 95 mph. Ida is a small system, so fluctuations in strength can be quick to occur. Further strengthening is possible before wind shear increases. It would be reasonable to say that Ida has already exceeded expectations with wind strength. 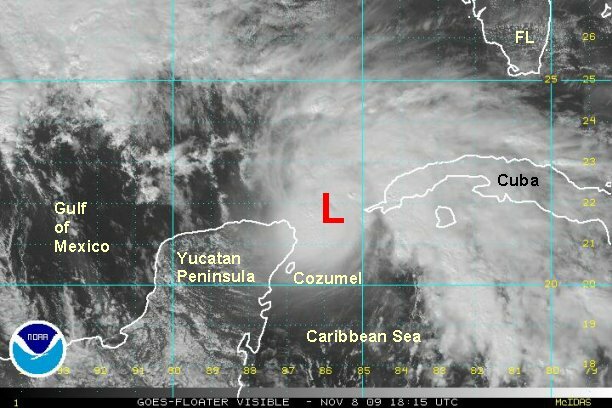 Cancun and Cozumel have faired well with only minor winds and rain. 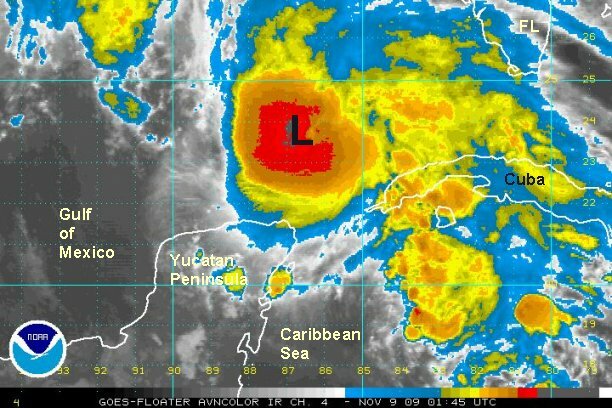 At 2 pm est hurricane Ida was centered near 21.8 N / 86.1 W or about 105 miles north northeast of Cozumel, Mexico 600 miles south of Pensacola, FL. Top sustained winds are estimated near 95 mph (NHC 100 mph). Ida is moving northwest at about 10 mph. Pressure 978 mb. 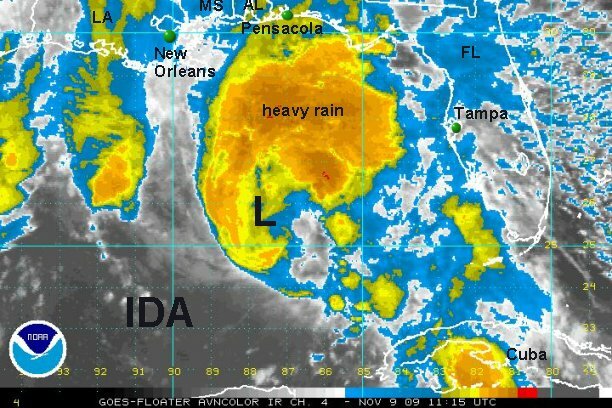 The latest forecast show Ida making landfall near the Alabama / Florida border Monday evening. As stated by NHC they are troubled by the spread of the forecast track later in the period. We agree with them that Ida should weaken significantly as wind shear increases and water temperatures get much cooler near the northern Gulf coast. This should mean that Ida will come in as an extratropical system. Most folks may not notice the difference though. 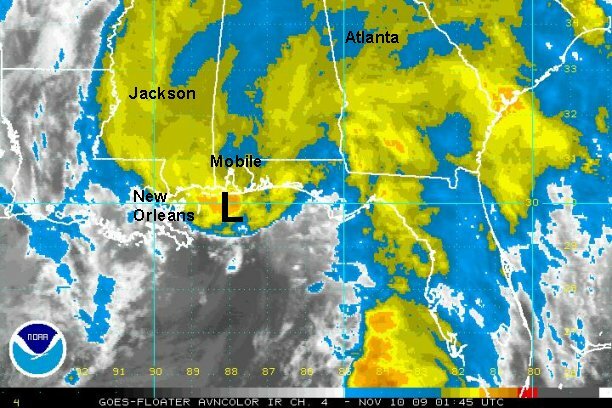 Interests in the northwest Caribbean and Gulf coasts of eastern Louisiana, Mississippi, Alabama, and northwestern Florida should watch the system carefully. A recon measured a flight level wind of 124 mph a few hours ago with a surface wind at 92 mph. Surface pressure has not changed appreciably since earlier this afternoon. Because of this, we are not changing our estimated wind estimate of 95 mph. Wind gusts should be significantly higher than the sustained wind. Flight level winds are higher too in tropical cyclones. 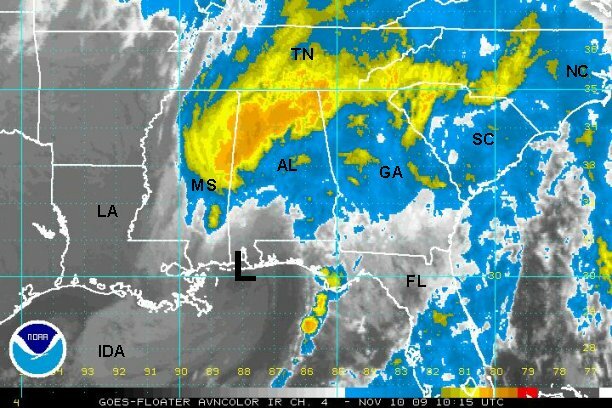 At 9 pm est hurricane Ida was centered near 23.7N / 86.7 W or about 465 miles south of Pensacola, FL. Top sustained winds are estimated near 95 mph (NHC 105 mph). Ida is moving northwest at about 13 mph. Pressure 979 mb. Ida should weaken significantly as wind shear increases and water temperatures get much cooler near the northern Gulf coast. This should mean that Ida will come in as an extratropical system. Most folks may not notice the difference though. The models are very different again. After talking ida to the coast as an extratropical system near the Florida / Alabama border forecasts diverge. One scenario brings the low into the Gulf again with the "backwards question mark" track. Another scenario stalls the low east of the Carolina coast and makes it subtropical. Interests on the Gulf coasts of eastern Louisiana, Mississippi, Alabama, and northwestern Florida should should finish any storm preparations by midday tomorrow. Ida is weakening rapidly and in our opinion is not hurricane any longer. It is also transforming into an extratropical cyclone with with the effects of the gustiest winds now far north of the center of circulation. A very recent recon found a pressure of 997 mb. We have never observed a hurricane with such a high pressure. The pressure structure is collapsing indicating a transformation of structure. The surface wind near the center was estimated at 45 knots and flight level of 60 knots. With this new information, we'll be very generous in estimating 65 mph. At 7 am est "hurricane Ida" was centered near 25.8N / 88.2 W or about 330 miles south southwest of Pensacola, FL. Top sustained winds are estimated near 65 mph (NHC 80 mph). Ida is moving north northwest at about 16 mph. Pressure 997 mb. Ida will not come in as a traditional tropical storm. Much of the effects are now well north of the center as the transformation to an extratropical cyclone in now rapidly occuring. The low will cross land later tonight, but should not by with much consequence for above reasons. Interests on the Gulf coasts of eastern Louisiana, Mississippi, Alabama, and northwestern Florida should should finish any storm preparations by midday. The national hurricane center followed suit and took Ida down to tropical storm strength at 10 am est. Tropical storm Ida is rapidly transforming itself into an extratropical cyclone. We will see a water rise on the coast where the fetch of wind has been blowing onshore. We will not see the sudden increase as the low crosses the coast, due to the fact that the strongest winds are now reorienting in a band far to the north of the low center. There is just a small ball of convection remaining on the northern semicircle with the low. The biggest concerns will be 1. flooding inland rains in the southern Appalachians and 2. water rise and some beach erosion where the the fetch has been onshore. Interesting that the news crews are all at the coast when 3-8 inches of rain may fall on the southern Appalachians. Seas are in the 15-18 foot range with some 20 foot + seas still likely. 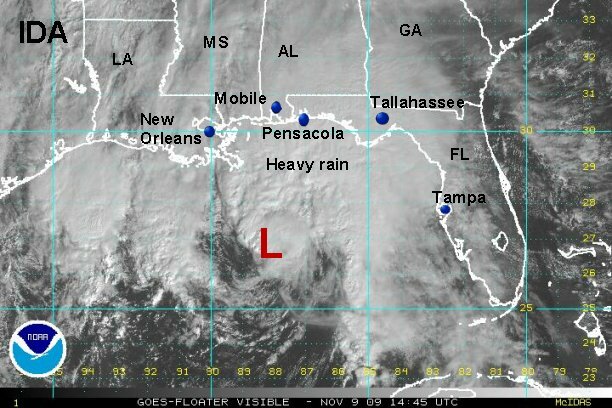 At 11 am est tropical storm Ida was centered near 26.7N / 88.2 W or about 265 miles south southwest of Pensacola, FL. Top sustained winds are estimated near 55 mph (NHC 70 mph). Ida is moving north northwest at about 17 mph. Pressure 996 mb. Ida will not come in as a traditional tropical storm. Much of the effects are now well north of the center as the transformation to an extratropical cyclone in now rapidly occurring. The low will cross land later tonight, but should not by with much consequence for above reasons. After a rapid weakening last night, tropical storm Ida strengthened some earlier this afternoon. A recon found that the pressure dropped from 997 mb to 991 mb. This allowed for some strengthening which has basically held status quo the rest of the day. The low center that almost devoid ed itself of deep convection this morning has rebuilt a small pocket of convection near the low center. As Ida gets closer to the coast, water temperatures are much cooler, this should allow for some additional weakening of the convection. Ida is now moving due north. It is expected to turn slightly northeast before landfall late tonight. Heavy rain stretches from extreme southeast Louisiana east to the western Florida panhandle and north into south central Alabama. Rainfall amounts of 2-6" will follow the path of the storm and north into the southern Appalachians. Some 6"+ amounts are likely in more persistent bands. Seas were measured up to 33 feet at a buoy "Thunderhorse" well southeast of the mouth of the Mississippi river as the center of the low passed by. Seas will increase tonight on the coast as the rough seas built by Ida's fetch propagate north. 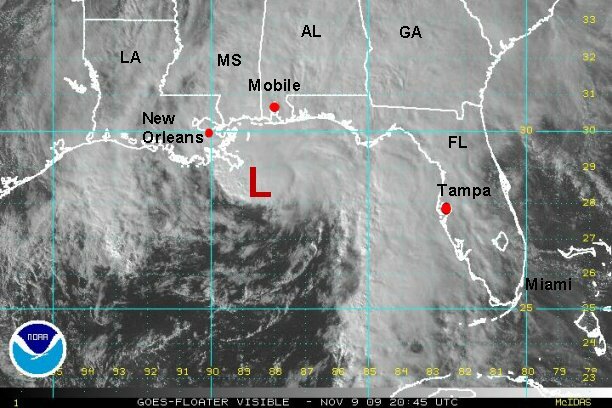 At 5 pm est tropical storm Ida was centered near 28.6N / 88.5 W or about 145 miles southwest of Pensacola, FL / 40 miles southeast of the mouth of the Mississippi river. Top sustained winds are estimated near 65 mph (NHC 70 mph). Ida is moving north at about 18 mph. Pressure 991 mb. At first glance, it is apparent that Ida doesn't resemble a tropical system at all. A recon flight from a few hours ago indicated that pressure was starting to go up. Ida is also slowing down allowing for heavy rain to fall over the same areas of the gulf coast. Rainfall of 6"+ is possible where the more persistent rain fall in southern Mississippi, Alabama and northwestern Florida. The heavy rainfall will move into eastern Alabama and into the southern Appalachians. Winds on the Gulf coast of Alabama are gusting to minimal tropical storm force - 40-45 mph. At 10 pm est tropical storm Ida was centered near 29.5 N / 88.5 W or about 100 miles southwest of Pensacola, FL. Top sustained winds are estimated near 60 mph (NHC 65 mph). Ida is moving north northeast at about 13 mph. Pressure 993 mb. Ida remains just offshore of the Mississippi / Alabama coastline. The low should move inland overnight. The heaviest of the rain has already moved inland. Ida is on the Alabama coast totally void of deep convection. The action has shifted northward into the central Gulf coastal states where a large area of heavy rain has formed. A general 2-4" (with locally heavier amounts) of rain has fallen from the western panhandle of Florida west to the Mississippi coast. 1-4" has already fallen in the interior of Alabama and eastern Mississippi. Recent winds from Biloxi indicate 28 mph, Mobile and Pensacola 20-25 mph. Top sustained winds are only about 35 mph offshore. Rainfall amounts continue to climb in northern Alabama and Georgia. Widespread totals of 2.5 - 4 inches has been reported from the Atlanta metro area west across northern Alabama into extreme east central Mississippi. Isolated amounts of 8" shows up on the dopper estimate between Huntsville and Tuscaloosa Alabama. Amounts will be in the 3-6" range with locally heavier amounts across north Georgia by later tonight. Heavy rain will progress east into the Carolinas over the next 2-3 days. Several inches of rain is also likely in these areas with additional 6"+ amounts possible. The remnants of Ida may redevelop off the North / South Carolina coast, becoming a coastal storm. Winds will pick up with gusty winds developing from the east / northeast into Friday. It's interesting to note that the worst U.S. effects of Ida will really be seen as it has transformed itself into a nonamed coastal storm. Widespread rain totals of 3-6" were seen across north Georgia and Alabama with isolated 8" amounts. As for the Mid-Atlantic states, these rainfall totals are being matched from eastern North Carolina to Maryland. Some 10" + amounts will likely be seen in southeastern Virginia where winds have been gusting to over 50 mph. Rainfall totals ranged from 3-6 inches across eastern Virginia eastern North Carolina with isolated amount of 8"+. Winds gusted to near 70 mph at the Virginia Capes last evening.